Located along the banks of the Tuckasegee River in the North Carolina mountains, you’ll find a quaint mountain haven of Cullowhee River Club with phenomenal views of the Blue Ridge Mountains and close proximity to numerous small towns. This is exactly what Dr. James Spirito and his wife, Cher were looking for. 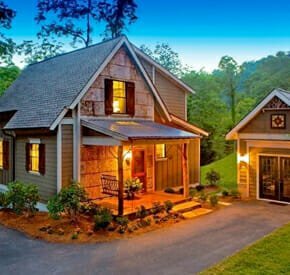 A home on the river in the heart of the Blue Ridge. “For us, it was like all of the stars fell in line. We wanted to live in North Carolina on a river, where there was a continuity in neighborhood design, and we found it at Cullowhee River Club,” said Cher. They are currently building a cottage that should be ready by late June, just in time for summer months in the mountains. The Spiritos will use this home as a vacation home as a nice getaway for “fun, casual, relaxation.” It will enable them to have more free time to enjoy their “antiquing” hobby. From this mountain location, Cher says its an easy day’s drive in any direction for antiques with all of the historic towns in neighboring states. Cullowhee River Club is designed as a respite from the world with a Grand River Lodge and the River Park Pavilion where residents can enjoy one another’s company or simply relax along the river. The Property Owners Association even rents boat racks monthly on a first come, first served basis. And, because 60% of the land surrounding the Cullowhee River Club will be perpetually protected open space placed in a conservation easement, the community will have groomed hiking and biking trails for its residents to enjoy. The trails will also connect to the planned Jackson County Greenway Trail System. While the Spirito’s primary home will remain in Florida, the Spiritos love to travel the world and have been to just about everywhere except the Middle East. “I have recently retired from Delta Airlines and am still in the stage of missing it very much. There is a reason there is a club called Clipped Wings … you never quite get over the longing for taking to the skies,” says Cher. They even own a condo in Thailand, from where they travel about. With Cher being a former flight attendant, the Spiritos have been able to take advantage of world travel, even many times to her favorite country of Japan, where the people are known for their honesty and respectful nature. The Spiritos just celebrated their 39th wedding anniversary. Dr. James Spirito (Dr. “J”), a retired engineer, inventor, defense contractor, and professor still has much to offer the world. He is currently building a 1933 Hot Rod. For Dr. “J” life and retirement have taken him down many roads, some straight and some curvy but always an adventure. He is a refreshing example of work hard and play hard. The Spiritos have a great love and admiration for one another, have built an enviable life, and are looking forward to enjoying their next phase in the mountains of North Carolina.